Indian Cricketer Mohammed Shami visits our very own C&C. Crystal Palace and Holland defender Patrick Van Aanholt pays a visit. Chelsea footballer Ngolo Kante visits MD Frank Khalid. Elbrook Cash & Carry is proud to add recipient of the 2017 AFRA Food & Restaurant awards to its achievements. 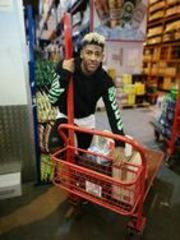 Indian All rounder Hardik Pandya visited Elbrook Cash and Carry. For another consecutive year Elbrook Cash & Carry makes The Grocer's Top 30. James Bond themed Gala dinner in aid of the British Asian Trust. Chak89 graciously hosted a fundraiser for the Pakistani cricketer Shahid Afridi's foundation on Saturday 13th August 2016. Elbrook Cash & Carry is one of the top 30 Wholesalers of 2016 in the UK. Elbrook annual awards dinner was held at the prestigious Chak89. Suppliers, retailers and celebs attended the event. Elbrook Celebrated 6th Charity Gala Dinner in style on Thursday 29th October 2015. Bollywood star Arjun Rampal pays a visit to Elbrook Cash & Carry and Chak89. Elbrook continues to flourish as it makes The Grocer's top 30 wholesalers list. The Coronation Street star, Michelle Keegan was at Elbrook Cash & Carry for her shopping. Today’s Group is delighted to announce that two new members will be joining the board– Fukera Khalid, Managing Director of Elbrook Cash and Carry Ltd, and Nick Ramsden, Group Managing Director of D B Ramsden Cash and Co. Ltd – following their election at the Annual General Meeting which was held on 5 November 2014.